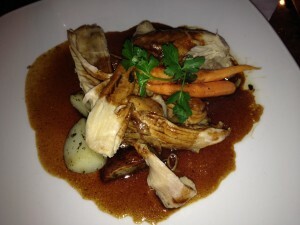 My friend Mary raved about the roasted suckling pig at VIA in Worcester, and told me I had to try it. VIA is a part of the Worcester restaurant group, which also owns Sole Proprietor and 111 Chop House, both of which I have been to and enjoyed. My opportunity came on Saturday when Allison and I went to Alton Brown’s Edible Inevitable show performing at the Hanover Theater. There was an impending blizzard, but that was not going to stop me from porcine goodness and seeing my favorite TV food personality. I could not get a reservation - it was the Saturday of Valentine’s Day weekend – but we had no trouble getting a walk-in table in their fully enclosed glass patio area. I ordered the aforementioned roasted suckling pig ($25) and a side of mushroom risotto ($6). Allison had Ragu of Italian meats ($20). 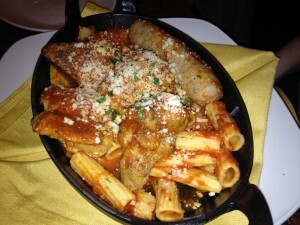 The description was “slowly roasted pork, meatball, beef, chicken, and sausage, over ziti” The ziti came in a large cast iron casserole topped with big chunks of all the listed meats. It was not what Allison was expecting; she thought was a sauce with everything cooked down in it. She did not want the whole sausage (her loss, my gain) and did not like the meatballs; they had a strange mushy texture. I was disappointed by my pork. It was inconsistent; some pieces were dry and stringy while other bites were tender and succulent. I was also hoping for some pieces of crispy skin or bone to gnaw on, but neither was to be found. It was served with some nice roasted potatoes. The mushroom risotto was surprisingly good; there were meaty mushroom slices and the rice was cooked correctly. All entrees come with a decent sized green salad and the bread was good and crusty. 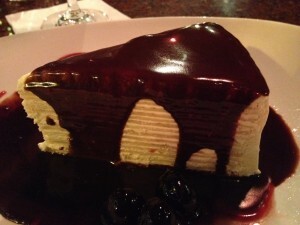 We shared VIA’s crêpe cake ($8) for dessert. It’s a lovely visual - 15 crêpes layered with a cream cheese and mascarpone filling and then drizzled with a chocolate garnish. However, cold crepes just are not that tasty. The “cake” was heavy and dense. I wish we had gotten gelato instead. Our server was friendly and attentive and I enjoyed my cantaloupe cocktail (Ketel One vodka, watermelon liqueur, cranberry, pineapple, and orange juices). On a side note, I really enjoyed Alton’s show. It was funny and entertaining. I would definitely try to catch it if it is in your area.